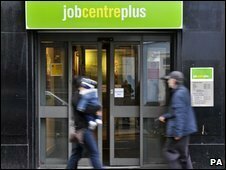 The number of people unemployed in the UK rose by 43,000 to 2.5 million during the three months to February, official figures have shown. The jobless total is now at its highest since 1994. 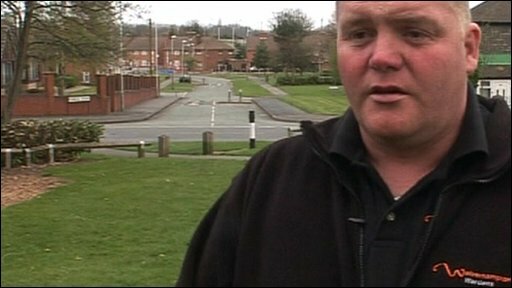 The rate of unemployment now stands at 8% - the highest since 1996 - the Office for National Statistics said. However, the total number of people claiming unemployment benefit fell in March by 32,900 to 1.54 million - a much sharper fall than expected. The ONS figures showed youth unemployment rising, with 929,000 16 to 24-year-olds out of work in the December to February period - a rise of 4,000 on the previous three months. Unemployment among the over-50s rose by 7,000 to 396,000. There was also a rise in the number of people classed as economically inactive - those out of work and not seeking work. They rose by 110,000 to a record total of 8.16 million, equivalent to 21.5% of the population. The majority of that rise was due to an increase in the number of students, as young people decided to enter education instead of seek jobs. Commenting on the figures, the Work and Pension Secretary Yvette Cooper, said the figures were in line with the government's expectations. "What this shows is that we are not out of the woods yet," she told the BBC. "That's why it is so important that we keep increasing the support for the unemployed, but also that we sustain the overall support for the economy." But Theresa May, shadow work and pensions secretary for the Conservatives, said it was "grim news for tens of thousands of families up and down the country". "A clear sign that the government's policies aren't working," she said. Craig Gutteridge: "Slowly but surely I started to believe in myself"
"I think the government isn't giving enough support in terms of the welfare system as a whole." City economists held equally mixed views. Vicky Redwood, economist at Capital Economics, warned the figures pointed to a recovery without job growth in the UK economy, particularly with public sector cuts looming further down the line. But Brian Hilliard from Societe Generale was more optimistic. "The labour market is in far better shape than we dared to hope for at this stage of the economic cycle," he said. Figures from the ONS also showed a rise in wages for those still in work. Average weekly earnings including bonuses were up 2.3% in the three months to February compared with the year before.